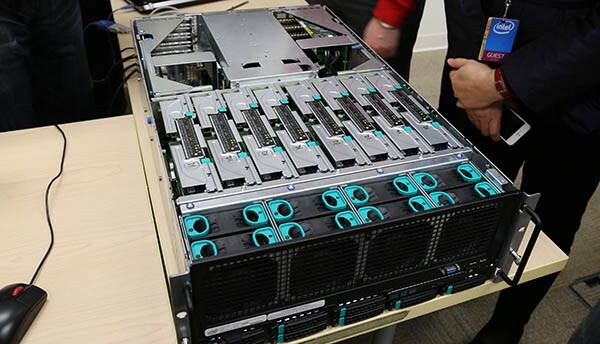 Today is the official launch date of the Intel Xeon E7-4800 / E7-8800 V3 series of processors code named Haswell-EX. The new Intel Xeon E7-4800 V3 and E7-8800 V3 processors are meant to scale to 4 way and 8 way systems while supporting up to 6TB of DDR4 RAM in a 4 socket or 12TB of DDR4 RAM for a 8 socket machine. I recently had the opportunity to head up to Intel’s Jones Farm facility in Oregon for a press briefing on the new Intel Xeon E7 V3 series. One of the more interesting exhibits there was a pair of running Intel Xeon E7 V3 systems. We did not have the Extech sound meter with us, but they were running very quiet due to the Haswell-EX architecture. We saw this with other Haswell series chips. From an architectural point of view, the E7 series is moving from Ivy Bridge-EX to Haswell-EX so one gets features such as AVX2 and on-die power management with the new chips. One also gets more cores, now up to 18 like we saw with the transition to Haswell-EP. The last level cache has also moved up to 45MB accordingly. Interestingly, the Intel Xeon E7-4800 and E7-8800 V3 chips seem to support both DDR3 and DDR4 memory. 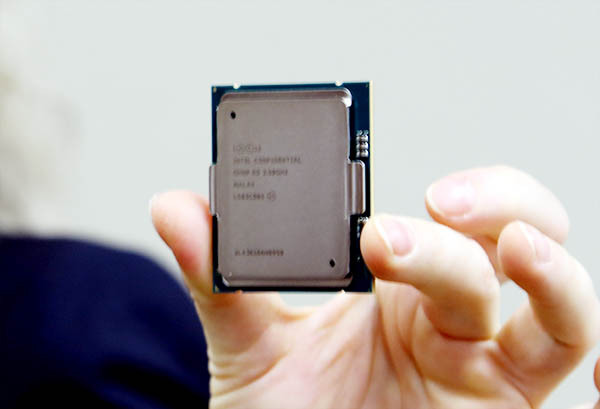 It seems like Intel has made Haswell and maybe Broadwell processors with dual memory controllers in the silicon as this is a common trend we are seeing around the memory transition. Intel also moves to sets of ring buses connecting sets of columns and then a high speed switch between the two sides. This is a change from the Ivy Bridge-EX series. In terms of options there are now only 4 socket and 8 socket capable parts with the dual socket only capable parts falling off of the SKU list. Unlike Haswell, Haswell-E and Haswell-EP parts, the TSX bug was fixed for the Xeon E7 V3 series. As a result, the Intel Xeon E7 V3 processors are the second Xeon processors to fully support TSX. 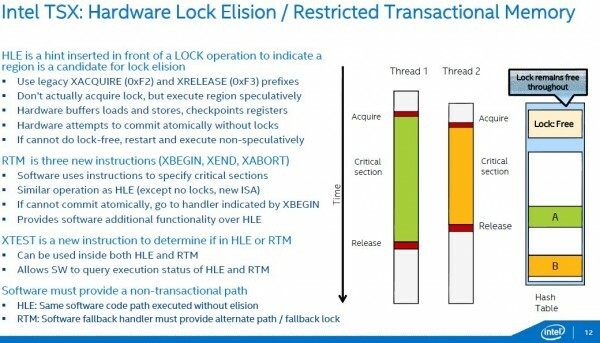 Intel also added new virtualization features to the Intel Xeon E7 V3 series focusing on VMM exit latency. As machines have more RAM and more cores, this becomes increasingly important. For those with older generation chips, there is a significant improvement. Beyond performance and scalability, reliability and stability are the other key pillars of the Intel Xeon E7 V3 value proposition. Run Sure is a new technology that Intel has been pushing with the Intel Xeon E7 V3 line which is the marketing name for Intel’s advanced RAS features. 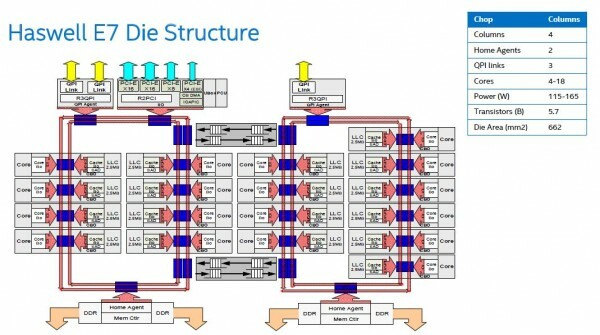 Like Ivy Bridge-EX each Xeon E7 V3 chip has 32 PCIe 3.o lanes per processor. We have heard that the silicon has a full 40 PCIe lanes as we would see on the Xeon E5 generation, however the remaining 8 PCIe lanes do not have associated pins. For more information, see my article on Tom’s IT Pro today. We also will have more information from the press event this morning. What is the name of that Intel Xeon E7 V3 System in the first picture?